HOLLYWOOD, California, November 3, 2011 — Canon Inc. and Canon U.S.A., Inc. today announced the introduction of seven new 4K EF Cinema Lenses, an all-new series of video cinematography lenses that, in addition to the company’s current lineup of interchangeable EF lenses for EOS single-lens reflex (SLR) cameras, form the core of Canon’s new Cinema EOS System. 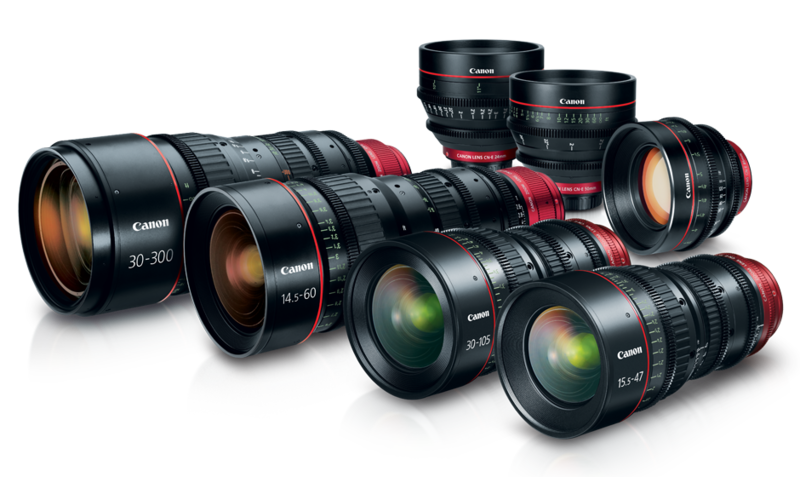 The launch of the Cinema EOS System marks Canon’s full-fledged entry into the digital high-resolution production industry. The new professional digital cinematography system spans the lens, digital video camcorder and digital SLR camera product categories. Canon’s new EF Cinema Lens lineup includes four top-end zoom lenses covering a zoom range from 14.5 mm to 300 mm—two models each for EF and PL lens mounts—and three single-focal-length lenses for EF mounts. All seven new lenses are capable of delivering exceptional 4K optical performance and offer compatibility with the Super 35 mm-equivalent image format. The three single-focal-length EF lenses can be used with cameras equipped with 35 mm full-frame sensors. Like their wide-angle and telephoto cinema zoom lens co-stars, Canon’s new CN-E24mm T1.5 L F, CN-E50mm T1.3 L F and CN-E85mm T1.3 L F cinema lenses deliver 4K optical performance. The three lenses, designed for use with EF mounts, are compatible with not only industry-standard Super 35 mm-equivalent cameras, but also 35 mm full-frame, APS-H and APS-C sensor sizes. The trio incorporates anomalous dispersion glass and large-diameter aspherical lenses for high resolution imaging throughout the frame, and features a newly designed 11-blade aperture diaphragm for gentle, attractive blurring.